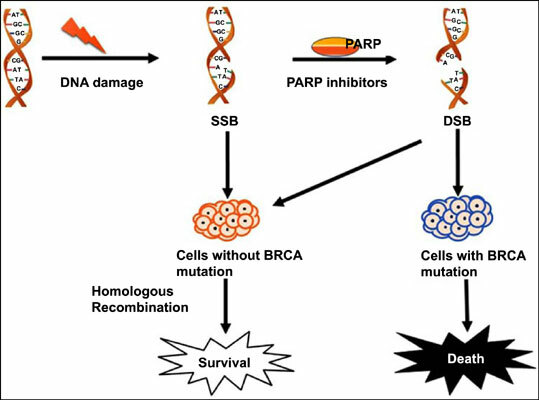 Recently, novel drugs that inhibit the enzyme poly (ADP-ribose) polymerase (PARP) based on the concept of synthetic lethality are used for cancer treatment. Three PARP inhibitors (olaparib, rucaparib and niraparib) are approved for the treatment of recurrent ovarian cancer in the US or Europe, while another two (veliparib and talazoparib) showed promising anti-cancer activity. This review aims to summarize the current status of clinical trials on PARP inhibitors and then discusses studies aimed to identify biomarkers for predicting the efficacy of PARP inhibitors. Keywords: PARP inhibitor, DNA repair, pharmacogenetics, drug response, cancer, veliparib, talazoparib. Keywords:PARP inhibitor, DNA repair, pharmacogenetics, drug response, cancer, veliparib, talazoparib. Abstract:Recently, novel drugs that inhibit the enzyme poly (ADP-ribose) polymerase (PARP) based on the concept of synthetic lethality are used for cancer treatment. Three PARP inhibitors (olaparib, rucaparib and niraparib) are approved for the treatment of recurrent ovarian cancer in the US or Europe, while another two (veliparib and talazoparib) showed promising anti-cancer activity. This review aims to summarize the current status of clinical trials on PARP inhibitors and then discusses studies aimed to identify biomarkers for predicting the efficacy of PARP inhibitors.